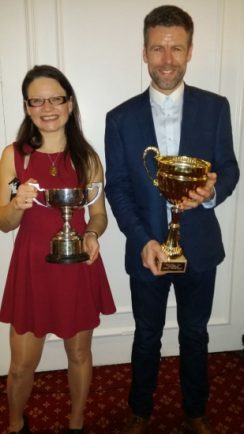 CYCLING: SOME of the borough’s most talented pedal powered athletes were celebrated last weekend at Solihull Cycling Club’s annual awards presentation. Many of the club’s 500 members attended the evening at St John’s Hotel to celebrate the year’s achievements on the road. Among the award winners were road race, time trial, cyclocross, track and hill climb club champions as well as President Awards for outstanding achievements to six members. Bob Richards, Richard Burt, Paul Mann, Matt Shaw, Jake Stewart and Danielle Khan all picked up President Awards for their efforts in the past 12 months. Bob managed to win the National and World Championships in the Individual Pursuit. Paul became the national track champion of the League of Veteran Racing Cyclists for over 55s in October, while 16-year-old Matt won the National Youth U16 Circuit Series. Jake Stewart and Danielle Khan were recognised for their National and International success. Richard Burt also picked up an award after his team of Sandra Turner, Mike Pridmore-Wood, Ian Spencer and wife Lorely Burt raised £25,000 for the Dementia UK charity by completing the 100 toughest hills in the UK on his bike – in less than two weeks. Visit www.solihullcc.org.uk for further information about Solihull Cycling Club.